Corby Town’s good form continued with a fine 4-1 success over Bedford Town last weekend. 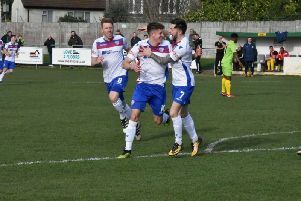 Goals from Delroy Gordon, Connor Kennedy, Joel Carta and top scorer Elliot Sandy secured a sixth successive home victory and extended the Steelmen’s current unbeaten run to seven matches. Corby remain five points behind leaders Peterborough Sports in the battle at the top of the Evo-Stik League South Division One Central and will be looking to maintain their impressive run when they travel to Barton Rovers on Saturday. And boss Steve Kinniburgh believes his team have “turned a corner” as they head into the business end of the campaign. game play and the understanding of what we wanted to do,” the Corby manager said. “I said numerous times during that period that it was all about consistency and by that, I meant it was a case of us trying to do what we wanted to do on a regular basis. “And I think we have turned a corner from that point of view. “All the players are on board with what we want to do and we know we sometimes have to have a different approach depending on the match we are playing. “I think all of that has really shown in our results and resolve in the last few weeks. “We showed it again last weekend. to take control of things and got the goals to finish it off. “It was another example of dealing with a situation and getting the result we needed."